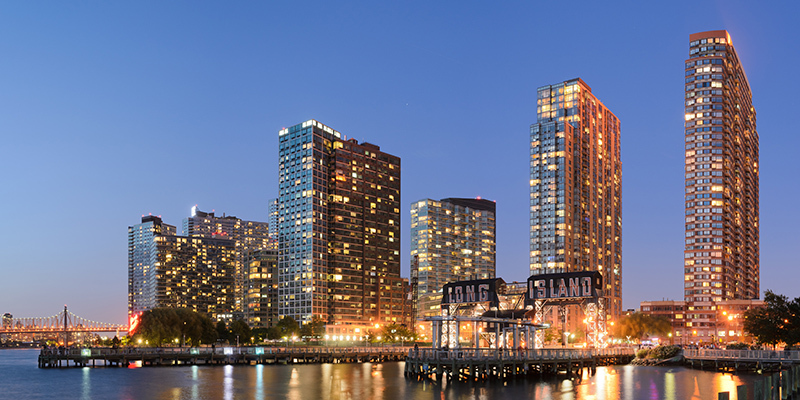 High-rise development in urban areas like Queens, New York, is rapidly accelerating. Is the Passivhaus standard a feasible strategy for achieving energy efficiency and resiliency in this context? Photo: King of Hearts. License: CC BY-SA 3.0. A study funded by New York State Energy Research and Development Authority (NYSERDA) indicates that the Passivhaus standard—notable for reducing heating- and cooling-related energy use by 70%–90%—could successfully be applied on tall residential buildings in dense urban environments like New York City at a viable cost. The detailed methodology and conclusions of the study are outlined in a report published last month. Researchers compared a large, mixed-use multifamily housing project designed to achieve LEED Silver certification (under LEED 2009)––currently under construction––to a theoretical Passivhaus version of the same building. They found that the Passivhaus version would use 47% less energy overall and require a 2.4% increase in capital costs. Upgrading to Passivhaus could be accomplished using common construction methods and requiring minimal changes to aesthetic design, according to the report. It was determined that the 36% window-to-wall ratio of the original design could be maintained by upgrading the windows to include high-performance triple glazing and thermally broken frames. The payback period for the upgrades was estimated to be 24 years, though the authors argue that certifying to the Passivhaus standard will likely become increasingly more cost-effective as the building industry gains familiarity. Though the study demonstrates that the added cost may not be an insurmountable barrier, the report describes a number of other challenges that must still be addressed before the Passivhaus standard is adopted as a mainstream approach in urban high-rise construction. One significant challenge relates to the level of workmanship and coordination required during construction in order to successfully install the air barrier. Variable construction practices, product availability, and cultural use patterns also limit the current applicability of Passivhaus in certain locations and on particular building types. Despite these challenges, it is clear that a paradigm shift is within view. Municipalities in Europe have mandated the Passivhaus standard in various ways and New York has introduced it as an energy code compliance path for new city buildings. With the publication of this optimistic feasibility study, it is possible that more U.S. municipalities will soon follow suit.